Mount Bromo East Java presents its beauty that has the capability of gaining popularity not only within the local tourists, but also foreign tourists. Knowing as the active volcano, Mount Bromo is located near the boundary of Lumajang, Malang, Pasuruan, and Probolinggo regency. The mount itself is really incredible and wonderful where people from every corner of the world want to climb this 2392 m/dpl mountain. Mount Bromo does not only promote itself since it is covered with many beautiful places and sites waiting to be covered and explored. Belongs to Bromo Tengger Semeru National Park, the mount offers different five view points where visitors can experience the beauty of Mount Bromo and the stunning sight of sunrise and/or sunset. What can you do in Mount Bromo? Visitors coming to Mount Bromo usually have the similar purpose; they do the trip at 3 am in the early morning by taking jeep or riding a motorbike and wait for the sunrise at the top of the hill. 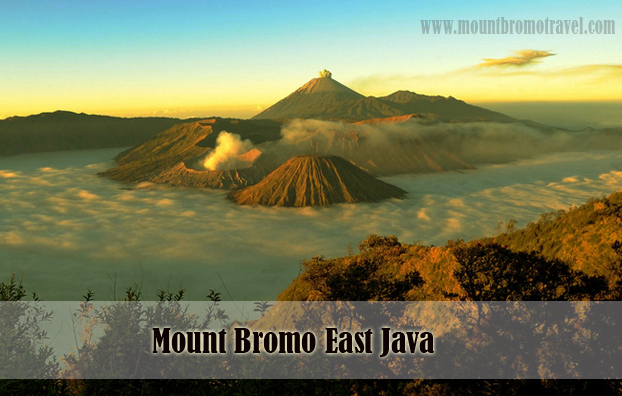 But Mount Bromo and the surroundings have such stunning views and places that you are not going to miss them. Doing the journey to Mount Bromo East Java does not complete without exploring view points. Seeing all around Mount Bromo from the height gives you another chance to praise the beauty of the nature. Here you have a golden opportunity to see the sunrise. Pananjakan, Bukit Cinta, Seruni Point, Puncak B29 Bromo, and Bukit Kingkong are the places where you can enjoy the mighty Bromo. Climbing 250 stairs of the cater of Mount Bromo wouldn’t be so exhausting and tiring since you will be presented with remarkable views, like the formation of curvy lines occurred because of Tengger Mountain and Mount Batok. To reach these stairs, visitors usually ride a horse or on foot. Padang Savanna, or local people usually call it as Teletubbies hill, has a very spacious meadow where you can express yourself here and feel the freshness along with coolness. It is located at the southern of cater of Mount Bromo. The sea of sand (whispering sands), or in Indonesia they call it as “Pasir Berbisik“, does have its own unique and characteristics that you barely see in other places. Bring your ears close to the sand and you will hear as if it whispers to you. Where to stay in Mount Bromo? Proper accommodations and transportation’s can be found in Mount Bromo and the surroundings. You can find lots of hotels to rest your sleepy heads, restaurants to fill your stomach, and souvenir stalls to buy souvenirs for friends and families. There are also guesthouses and restaurants that fit to your budget. Find further information through internet, and do not forget to check tour packages in order to find cheaper and flexible trip to Mount Bromo East Java.